Nihil novi is used to name one of the first Polish ‘liberty’ act (called sometimes the constitution of 1505), namely, Nihil Novi sine communi consensu ( i.e., “Nothing new without the consensus of all”, in short form: “nothing about us without us“). It was an important victory for Polish noblemen (in Polish szlachta) over the kings. This act forbade the king to pass new laws without the agreement of szlachta representatives (Polish parliament, Sejm and Senat), with the exception of laws regarding royal cities, crown lands (‘królewszczyzny‘), mines, fiefdoms, peasants, and Jews. The act was signed by King Alexander the Jagiellonian during the Sejm session in Radom on the 31st of May 1505. English: Since general laws and public acts apply not to a single person but to the whole nation, therefore at this general diet in Radom, together with all prelates, councils and land deputies of our kingdom, we have considered rightful and just, as well as decided, that from now on nothing new may be decided by us and our successors, without a common consensus of senators and land deputies, that would be detrimental or burdensome to the Commonwealth (Rzeczpospolita), and harmful or injurious to anyone, or that would alter the general law and public freedom. Polish: Ponieważ prawa ogólne i ustawy publiczne dotyczą nie pojedynczego człowieka, ale ogółu narodu, przeto na tym walnym sejmie radomskim wraz ze wszystkimi królestwa naszego prałatami, radami i posłami ziemskimi za słuszne i sprawiedliwe uznalimy, jakoż postanowilimy, iż odtąd na potomne czasy nic nowego stanowionym być nie ma przez nas i naszych następców, bez wspólnego zezwolenia senatorów i posłów ziemskich, co by było ujmą i ku uciążeniu Rzeczypospolitej oraz ze szkodą i krzywdą czyjąkolwiek, tudzież zmierzało ku zmianie prawa ogólnego i wolności publicznej. In some sense the meaning of this act resembles the well know in Anglo-Saxon world slogan “No taxation without representation” which summarized a primary grievance of the American colonists in the 18th century. Americans complained that taxes were imposed by British Parliament without their consent, which in their opinion violated the traditional Rights of Englishmen rooted the Magna Carta Libertatum (“Great Charter of Freedoms”) issued in 1215. 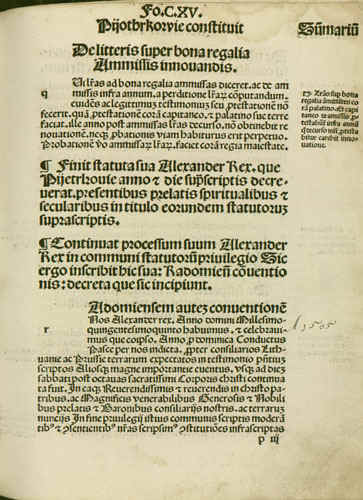 The continuation of the Nihil novi … constitution were The Henrycian Articles (Polish: Artykuły henrykowskie) which stated the fundamental principles of governance and constitutional law in the Polish-Lithuanian Commonwealth in the form of 21 Articles written and adopted by the szlachta in 1573 at the town of Kamien, near Warsaw. The document took its name from that of Henryk Walezy the first elected Polish king, who was obliged to sign the Articles before being allowed to mount the throne. Subsequently every king-elect was required to swear fidelity to them. The Articles stipulated that a king could be elected only by “free election.” Every two years he was required to call a general sejm (Polish “sejm walny,” or parliament). Any levy in mass or levy of taxes could be authorized only by the sejm. The Articles incorporated the Warsaw Confederation provisions guaranteeing almost unprecedented religious freedom. The Articles upheld the informal tradition that the king could not call a levee en masse (Polish: pospolite ruszenie) to serve outside the Commonwealth’s borders without compensation and that he must pay for the royal army (wojsko kwarciane). It is worth to underline that according to the Articles, if the monarch were to transgress against the law or the privileges of the szlachta, the Articles authorized the szlachta to refuse the king’s orders and act against him (by raising a rokosz, or rebellion). Each king had to swear that “if anything has been done by Us against laws, liberties, privileges or customs, we declare all the inhabitants of the Kingdom are freed from obedience to Us”.